Jonathan Williams: Will no 2015 mean Upside in 2016? 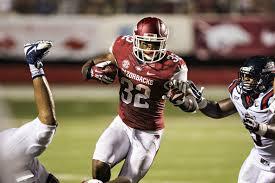 Jonathan Williams, Arkansas 5′ 11″ 220 lbs. Cons: Missing his senior season due to a leg injury is cause for concern, but he did quite a few drills in Mobile and plans to have a pro day that will assure NFL teams that the back is fully recovered. Even before the injury, Williams has always been more of a north/south runner than someone with fantastic lateral agility. This makes him more of a candidate for a power running team. Once the back is clear of the line of scrimmage, the former Razorback runs a bit too high, leaving his body open to big hits. Williams is average in pass protection and usually traps the pigskin to his body instead of cleaning catching it. I believe he can improve in the passing game, but he will need to get coached up. Pros: Williams is a powerful, patient back that is willing to run it between the tackles, uses good pad level near the line of scrimmage, falls forward while keeping his legs churning for extra yardage. The balanced runner rarely goes down on first contact, swats away would-be tacklers, and can break arm tackles easily. This makes him an effective short yardage/goal line back. The former Razorback can be a quick decision maker that sees the entire field well (including finding the cutback lane). Williams will use spins, stiff-arms, jump cuts, and shoulder shakes to make defenders miss. Overall thoughts: If Williams has a good pro day to show the NFL his full health, he should be in the top seven rookie running backs drafted in your rookie drafts this spring/summer. I believe he will be an excellent power back that has some foot quickness and loose hips. The runner’s true value will be quite dependent on the scheme he gets placed in.